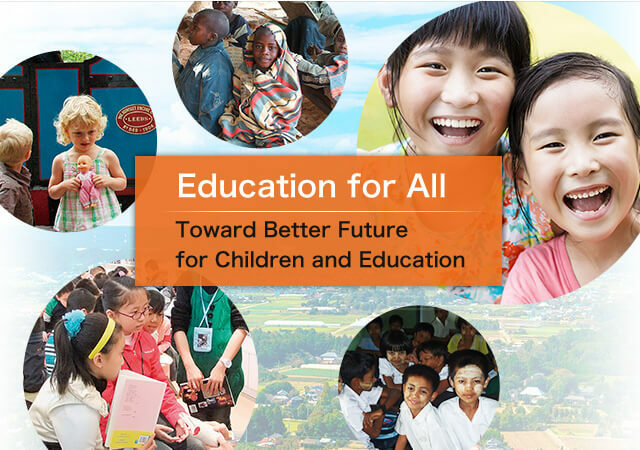 The National Conference on Educational Research is a research conference covering education issues and practices at national level and is held annually by Japan Teachers’ Union. It has been organized since 1951. The Conference commences with General Assembly followed by breakout sessions. In the Assembly, keynote report and commemorative speech are presented and education issues are shared. Breakout sessions can be categorized into three types: subject-specific sessions such as Japanese, foreign language and science, issue-specific sessions such as human rights, special needs education and peace education, and a special session that addresses contemporary education issues. 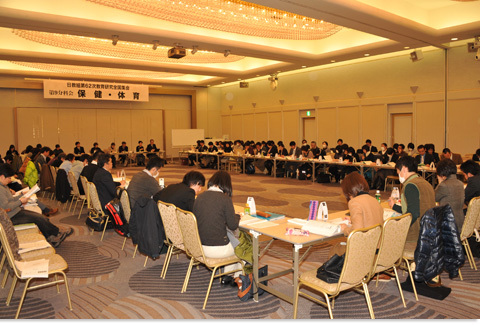 The Conference was held in Saga Prefecture from January 26 to 28 this year. About 10,000 participants from all over the country convened, and everyday educational practices were discussed in 26 breakout sessions. 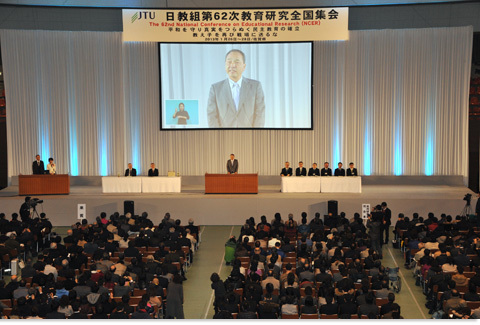 JTU President Ryosuke KATO gave an address at the General Assembly where about 3,000 participants convened. An excerpt of the address is provided below. "This past year, we have faced harsh reality where cases on ‘death’ of two boys were presented. In the cases, the children ended their own lives due to ‘bullying’ and ‘corporal punishment.’ We cannot disregard these problems when talking about educational practices at the National Conference being held. When I heard about the two cases in the media, I looked back my past experiences working as a teacher and asked myself if I managed to identify the nature of ‘bullying’, if I was able to save children suffering from bullying and if I never punished my students physically in those days. Then I found myself unable to deny that I never punished them and acknowledge that I did save them. I admit that this was mostly the fault of my lack of teaching ability. It was also the fault of most other teachers of every grade and at school as a whole for having failed to watch over children due to their lack of practical skills in education. As school is where children mingle with and expose their true feelings and emotions to one another, various sorts of problems arise among them. Act of leaving peers out which leads to ‘bullying’ and ultimately acts of violence and threat have taken place in reality. The question is why adults, schools and families surrounding the children had failed to work in cooperation to address those problems before those evolved. Weren’t there any ways where they could have made the children realize those problems themselves at an early stage and paved a path for them to overcome the difficulties? We must say that our efforts are still inadequate in achieving education that helps children grow mentally strong enough to feel other people’s pains. Nurturing children’s capacity to embrace other people’s pains involves the questions of whether we ourselves have emotional and spiritual maturity necessary to accept children’s mental pains and whether we are committed to continuing to closely watch over them. If we have such traits and determination, it will be possible for us to inflict neither corporal punishment nor mental abuse on children. This should provide the foundation for education that does not allow ‘corporal punishment’ and keeps a close eye on ‘bullying’." After the address given by JTU President, Professor Itsuki UCHIDA (Honorary Professor of Kobe College) presented speech titled "Crisis of Education – Coping with Globalization." The Special Breakout Session was composed of a series of Workshops and "Child Symposium." One of the Workshops was arranged by a local organization and dealt with the theme "Let’s Think about Internet Damage." 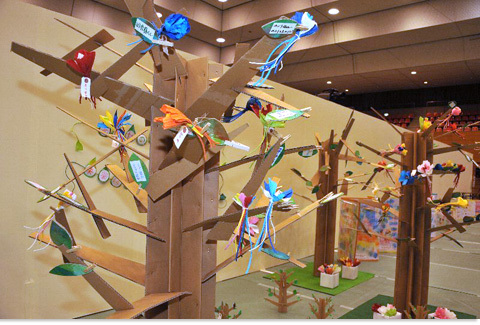 There was also a Workshop where the room was transformed into a forest by creating trees and flowers from cardboards (as shown in the photo above). Seven local secondary school students gave their honest opinions in the Symposium, and the venue was filled with participants eagerly taking notes. 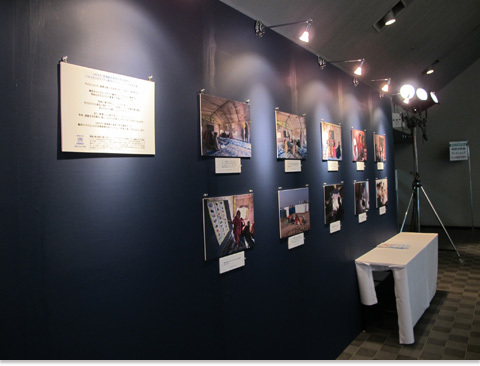 In addition, panel exhibitions showcasing activities of organizations that participated in the Workshops and JTU-related associations were organized. A total of 719 reports on educational practices including those for conveying the post-Great East Japan Earthquake and Disaster status were presented across the Breakout Sessions. The Appeal (downloadable from the link below) was created after the three days of discussion, which successfully concluded the Conference.